Again it has been a while since I have done any posting, but now I have a lot to write about. I wrote the draft of this post on the plane returning home following one week in Walt Disney World in Orlando, Florida. Anything touched by Disney exudes a sheer genius of attention to detail and an overabundance of creativity, and Walt Disney World is no exception. There is undoubtedly much to appreciate, and hence a nearly infinite list of things to tell you about! Disney World is an amusement park, well, really it is an amusement world, consisting of 4 Theme parks, 2 water parks and other entertainment areas. Amusement parks have rides, and I could spend all day describing the fabulous rides of Disney World. A whole other aspect, however, of not to be missed attractions are the full scale shows and what I'll call 'side show' entertainment that are part of the Disney experience. These are must see attractions and should be built into the schedule of a busy Disney day. This process can be aided by the use of the "Times Guide" provided daily at each park. 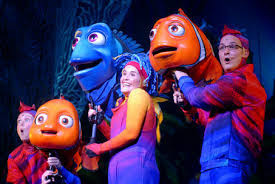 Finding Nemo--the Musical is a 40 minute full scale musical production housed in the 1500 seat 'Theater in the Wild' in the Dinoland USA area of Animal Kingdom. Every seat is good but I do recommend sitting toward the middle and farther from the stage, which means you should not arrive at the last minute, as we all know the Disney cast members are going to tell you where you are going to sit. The combined talent and ingenuity brought to this show are unparalled. Imagine the task of having to convince your audience that your entire stage show is taking place underwater. 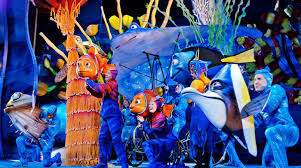 Finding Nemo does it with brightly colored puppets operated by talented actors and singers who cause the puppets to wiggle and swim while emoting the characters with their own facial expressions, voices, and body language. The tunes are catchy and the costumes sublime. Especially love watching Crush the sea turtle swim through the EAC singing "Go with the Flow." The songs will be with you for hours! Don't miss it! I've seen Festival of the Lion King four times now and I still feel like this is an absolute must see. Festival of the Lion King is a Cirque du Soleil type feast for the eyes which packs a variety of circus acts, a medley of Lion King tunes, and brilliantly costumed dancers into a center staged 30 minute presentation. Bright yellow monkeys swing from parallel bars, feathered birds fly above your heads, and a flame twirling hyena lights the stage on fire. Four elegantly costumed hosts get this show going with some jokes and audience competition. Before long you'll be ready to monkey around! There is a lot of eating and a whole lot of drinking going on in the World Showcase portion of Epcot. There is also a lot of great street entertainment representative of the eleven nations featured. These acts perform regularly, though on a schedule, throughout the day and greatly enhance your experience in the World Showcase. Shows generally last about 15 minutes. In the UK you can watch the "British Revolution" sing Queen, Bowie, and the Beatles. In Japan, you can watch "Matzuriza" beat their Taiko drums. In Italy, you can see "Sbandleratori Di Sansepolero" do their act of choreographed flag throwing. We also love the Chinese acrobats, who demonstrate a repertoire of grace, strength, agility, and incredible balance. Every act is so talented, the cream of the crop in their fields. It got way higher and way crazier! Our favorite, however, are the "Voices of Liberty," an a capella ensemble of nine featured in the American Adventure. I remembered how amazing they were from our visit SEVEN years ago so we made every effort to see them on this trip. Their tight harmonies and lively arrangements of folk and patriotic numbers were so inspiring and moving that we went to see them three times during our two days at Epcot, despite the long walk to get there. Who doesn't love a parade, especially when Disney does them with such flare? 2010 saw the return of the Main Street Electrical Parade to the Magic Kingdom following an eleven year hiatus. In 2014, the midafternoon "Festival of Fantasy" parade was added to the daily parade schedule. Though I do remember this not quite being the case in May seven years ago, at least in February trying to watch a parade in Walt Disney World is not an oppressive task. The parade route up Main Street, around the Hub, and through Frontierland is quite long so if your parade starts at three it is fairly easy to find a good spot along the Rivers of America right when the parade starts or even after. Most of the characters are far above eye level for easy viewing, even if you are not seated right under the rope. Festival of Fantasy is really just your typical Disney day parade. All of our favorite characters, including some of the newer ones, like Elsa and Anna from Frozen, Merida from Brave, and Rapunzel from Tangled, wave to guests while perched upon colorful and painstakingly themed floats, many with moving parts. Between the floats dancers in elaborate costumes performs their choreographed steps down the entire parade route while lip syncing the "Festival of Fantasy" lyrics. I always find these performers to be so beautiful. With every parade I see I must confess a twinge of jealousy, having missed my chance to be a shiny seashell happily cacheting down the street. Head to toe! This dancer is coral through and through!! What about this costume does not scream 'BIG TOP'? I thought I might look cute in this....hahaha!! And who doesn't love Tinkerbell sitting on a sunflower? Disney's Hollywood Studios has been host to the the nighttime spectacular, Fantasmic, since 1998. Fantasmic takes place in the 6900 seat Hollywood Hills Amphitheater. Fantasmic is a must see. I also like the experience of seeing it from a seat close to a refreshment stand where I can buy beer! Remember, in Disneyland you stand to see Fantasmic and no alcohol is sold. But Fantasmic is not new. Between Disneyland and Disney World I've seen it like 20 times. We know it by heart. New to Hollywood Studios is "Symphony in the Stars" which debuted late last year. Prior to its debut, DHS did not have a fireworks show. Crowds gather nightly on Hollywood Blvd. to watch the 8 minute fireworks show spectacularly choreographed to John Williams' brilliant 'Star Wars' soundtrack and sound bites from the movies including from the recently released "Star Wars: The Force Awakens." Who doesn't love fireworks and who doesn't love the soundtrack to Star Wars? The combo packs a happy punch. In a hurry for a dinner reservation, we almost bypassed this experience. We are glad we chose to stay. Well, that's enough said for now! I wrote this whole blogpost on the plane home! Hoped to get it published quickly and off to you--trying! Also hoping to get another WDW blogpost up and running soon! Here are a few more to leave you with... I must add that I took most of the pictures in this post with a new iPhone 6s. Unbelieveable. Cell phone camera are this good now. and we are quite cute too..